The leadership of Advocacy for School Libraries Special Interest Group is very excited and pleased to announce that Allison Roots Lewis will be representing the American Association of School Libraries and presenting a workshop on the Every Student Succeeds Act (ESSA) and how we can work with our legislators and local leadership, including a collaboration time where we can create a plan to get our “seat at the table.” The workshop will be on January 7th from 9:00 – 1:00 in the Las Cruces High School’s beautiful new library which was featured in a recent issue of “American Library Journal”. At the NMLA Conference, I did a very short presentation about ESSA and exactly where we can get involved. Here is the link to my presentation, which was actually created by AASL and edited by me: connecting-essa-to-school-libraries. Please take the time to visit the AASL website on ESSA at http://essa.aasl.org. On that website, you will find position statements and helpful documents for you to take to your district leaders. Start planning now and asking to be a part of the ESSA team for your district! School libraries play a very important role in this. 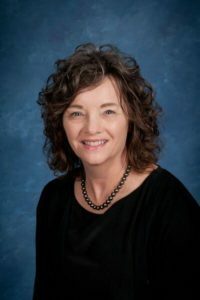 Kathryn Roots Lewis is the Director of Media Services and Instructional Technology for Norman Public Schools in Norman, Oklahoma. In this capacity, her areas of responsibility include oversight, planning, management, professional development, and financial responsibility for instructional materials, instructional technology, and libraries. She has been a school teacher and librarian at all levels. Kathryn is the Project Director for an IMLS National Leadership Grant. She serves on the American Association of School Librarians (AASL) Standards and Guidelines Editorial Board. She was named as a member of the first LILEAD Fellow group, a national professional development program for school library supervisors. Kathryn serves as Region 6 Director on the AASL Board of Directors. She is on the Oklahoma Technology Association Board and is a past president of the organization. Kathryn was recognized with the 2013 University of Oklahoma School of Library and Information Studies Outstanding Alumni Award, the ISTE Making IT Happen Award, Oklahoma’s 2012 Outstanding Technology Leader, and the 2010 Oklahoma Library Association (OLA) Library Legend. Kathryn is a Past Chair of the AASL Supervisors Section and a Past President of OLA. Kathryn has authored numerous articles and blogs including co-writing the AASL/Achieve document, Implementing the Common Core State Standards: The Role of the School Librarian Action Brief. I am so very excited about this opportunity for New Mexico School Librarians. Please plan to attend! I can’t promise warm weather, but I can promise warmER weather than you have in the north! If you haven’t ever heard Dr. Todaro speak, make sure you are here for the keynote! I was blessed to hear her yesterday (Tuesday) at the Statewide Conference on Libraries. She is a mover and a shaker and will give you tips for being the same! I hope we see you here! National Library Legislative Day is May 2-3, 2016. If you can’t make it there, you can now attend virtually! See below. Not able to make it to National Library Legislative Day? Don’t worry, you can still join us virtually! Starting at 9:00am EDT, we’ll be streaming the morning sessions live from Washington, DC. You’ll get a chance to hear Former Congressman Rush Holt (D-NJ) give a keynote, along with a timely rundown of all the major legislative issues that we’re addressing this year. Not only that, but you can also help expand the impact that we have on National Library Legislative Day by participating virtually. All you need to do is head over to the Virtual Library Legislative Day registration form and sign up. We’ll follow up by sending out talking points and resources that you can use to send an email, make a call, or post a Tweet through our Action Center. There’s also a handy resource toolkit, put together by the Harry Potter Alliance, for librarians who may want to get younger advocates involved. You can find out more by visiting theUnited for Libraries and the Harry Potter Alliance webpages, or by subscribing to the ALA Action Center. It’s that time for Library Legislative Day! Here are the plans! 6:30 p.m. – Dinner at Casa Chimayo in Santa Fe. If you can attend, please text Lorie Mitchell at 575-499-4909 to reserve your space. I will have some bags and candy to fill to hand out to the legislators. Please come help me put them together! I will have candy packages for all legislators and Governor Martinez and Lt. Governor Sanchez. They will be handed out at breakfast the next morning. Be sure to grab the ones for the people you are visiting! 8:00 a.m. – Breakfast/coffee at Capital Coffee (diagonal across from the State House on the east side). 8:30 – 10:30 – Meet with your legislators. Encourage to visit with your local legislators and members of the two Education Committees, if possible. Send out an email to them asking for appointments. I have five appointments already just with the few emails I sent out! Please tell them THANK YOU for the work they are doing for us! I don’t think they hear that near enough! 10:30 – Opening of the House & Senate. We will have Heather Christiansen (Portales High School) introduced in the Senate and Kim Barany (Las Cruces High School) introduced in the House. Please try to be in the galley to support our librarians in either the House or Senate! After the opening ceremonies, we will then head to lunch at a place to be determined. Probably Cafe Pasqual, but it depends on how many of us there are! Please text Lorie Mitchell if you plan to join us. I will send out text messages through Remind.com all day about meetings. I will update you on locations and such, too, throughout the day. To make sure you don’t miss the messages, please send a text to 81010 that says @asl-leg. Make sure you add the @ sign. Once you do that, you will be signed up for our Remind service and you will get all our messages. Check back to this page later today. I will be adding handouts we can give to the legislators! Save the dates of January 28-30th for Library Legislative Day, Disaster Preparedness Workshop, and ASL-SIG Workshop Day! On the 28th, we will meet at the State Capitol building to speak to our legislators about ongoing needs we have in the school library community. Later we will send out some talking points for us to take with us, and hopefully a handout that you can print out and bring with you. On the 29th, we will meet at the UNM Health Sciences Center Domenici Center West Building for the Disaster Preparedness Workshop. This workshop is designed to inform personnel working in public buildings about the possible deployment of Points of Dispensing (PODs) in those buildings in the event of a disaster/emergency situation. John Miller, (DoH Strategic National Stockpile Coordinator) and Bobbie Mackenzie (DoH New Mexico Medical Reserve Corps Volunteer Coordinator) will offer the four-hour workshop, Tactical Point of Dispensing (POD) Course. That afternoon we will be visiting school libraries in the area to see what exciting things they are doing with their students and teachers. There is a small grant for one night of lodging for out of town librarians. More information will follow about that! On the 30th, we will meet at Jefferson Middle School at 712 Girard Pl NE, Albuquerque, NM 87106 for our ASL-SIG Workshop Day. The workshop will be held from 9:00 – 1:00 with presentations on Book Repair & Weeding, InfOhio, and updates on our online workshops & mentoring groups. We will have lunch at 12 and then at 1:00 have our ASL-SIG Business Meeting, which we invite everyone to attend. We will be sending out more information as the time gets closer, so keep checking that email and watching this site!